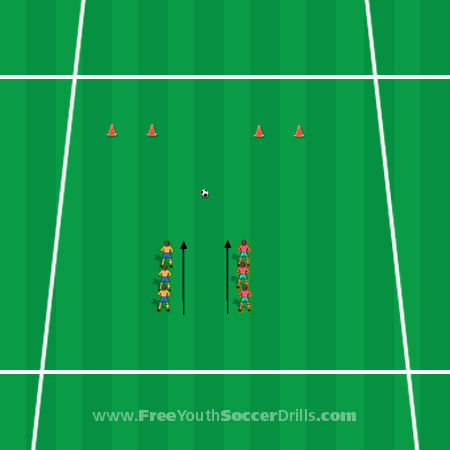 Soccer games for U8 - check out this drill! Soccer games like these are terrific fun and allow the players to enjoy the competitive side of the game also. This game called '1v1 to win' is a game I like coaching at the end of a session rather than playing a match. Take a look at the diagram below. Two teams are lined up next to each other facing two goals ahead of them (made out of cones) with only a single soccer ball required each round. Some games need a slight competitive edge to them and the young players love it. To begin, have two teams facing side by side behind a line as shown above. When the coach shouts 'GO' one player from each team at the front of the line will run toward the single soccer ball in the middle. It is then up to the red team to try and dribble the ball in to the right goal and the orange player to dribble the ball in to he left sided goal. Keep going until every player on the team has had a go against different oppostion players. If you have a lot of players (12+) set up two of the above diagram layouts simultaneously to prevent boredom and ensure everyone has plenty of game time. This game can be mixed up in a variety of ways. 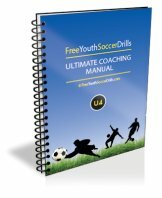 Firstly, if you have a player which is struggling to win any round then you can place the soccer ball closer to their goal to give them a better chance.An easy progression is to make the players go toward the other goal (should change their dribbling direction) or make them start by facing their team mates and the coach throws the soccer ball in after shouting 'GO'. You can also change the size of the goals to make it harder to shoot from long range and force the players to dribble it in instead of shooting which often occurs. You could also make the players shoot first time when they get to the ball (whoever gets there first) to practise shooting. Another way to practise shooting is to have two soccer balls each round (one for each player) and they both have to shoot towards a goal of the coaches choice as soon as they get to the ball. -> When both players are going for one ball make sure the shoulder nudges and tackles are fair but keep a certain level of competitiveness. Try out these other Soccer Games!